All too often, professionals, business owners and business leaders have the experience of trying to “move mountains” to get things done, feeling like they’re working harder than they should. Talent Dynamics is a framework that helps professionals, business owners & their teams to better understand how to get the biggest results for the effort exerted. We uncover why certain things “seem hard” and other things “come easy” and introduce you to strategies to make the most of your natural talents and collaborate with others or build an effective team to complement your strengths. 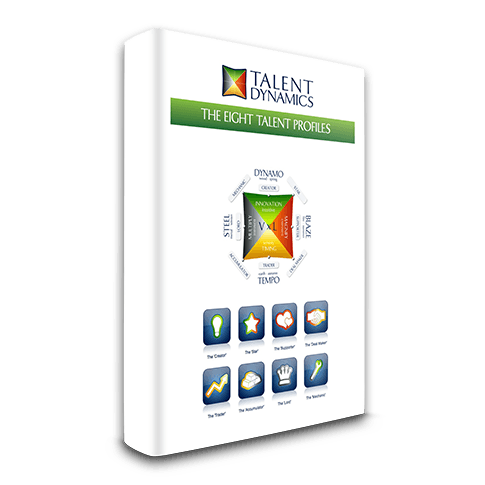 The starting point is understanding your Talent Dynamics profile. It begins with an online questionnaire which, once completed, provides you with an instant report via email with your results. If you want clarity to understand how the profile applies to you, we offer a 45-minute debrief to help you make the most of your report and answer questions specific to your situation, called the Career Checkpoint for professionals or Business Checkpoint (coming soon) for business owners & teams. If you’ve already taken this profile, you can receive a £50 credit towards the full price Checkpoint. We can profile entire teams and provide a composite. If this is appropriate for you, you can explore this with us by booking a FREE 30-minute consultation. If you are the leader of a team we can also give you a team profile based upon the individual profiles within the team. This can help you assess where the holes are and identify the types of profiles you need for a particular role based on the people who are most successful at that role. For example Stars make the best sales people and Supporters the best team leaders. It can also identify how to treat the team as a whole, what language to use and how to get the best out of them. Talent Dynamics is all about using and concentrating on individual and team strengths, passion and natural talent. A team in flow is more productive. We have many activities and workshops to help a company achieve their goals. Talent Dynamics works because it delivers results in performance and profitability while aligning your team to the spirit and purpose at the heart of your organisation. Being in flow means not only performing the role you are naturally talented at but also enabling flow for each one of your colleagues. That way you can leverage each other and, as a team, start breaking through the performance barrier. Trust, communication and performance accelerate: Procrastination, apathy and unexplained absences decrease while the team (and the whole enterprise), becomes a joy to work in. You, your team and your enterprise start making massive breakthroughs in performance, productivity and profit. This shows you the most natural activities you should focus on to stay in flow. Which famous role models you should study and learn from. What gets you into your flow. What are distractions and what are opportunities. How to channel your strengths in a way that the world responds favorably to. So you can see your balance of energy and understand why you do what you do. How to take even small amounts of value and get it into the hands of many. Roles to increase / destroy trust and flow. So, which style is right for you? … Take the test to find out. It only takes 20 minutes, and remember there are no right or wrong answers … only what is true for you! Take the test and discover your profile today. We will send you everything you need to take the test, so you can choose to complete it now (recommended), or complete it when you have 20 minutes of un-interrupted time.